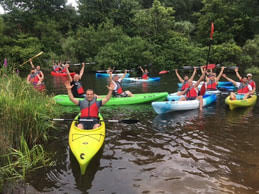 West Michigan Lighthouses - The Best Adventures Begin "Being on Water" at Pentwater Outfitters! Located just around the corner from Pentwater Lake, there are endless opportunities for "Being On Water" with Pentwater Outfitters. For starters, you want to be prepared for the adventure awaiting you. Pentwater Outfitters carries all the gear to keep you comfortable on the water. Are you looking for a quality kayak or stand up paddleboard that will keep you active as well as support a fun day? 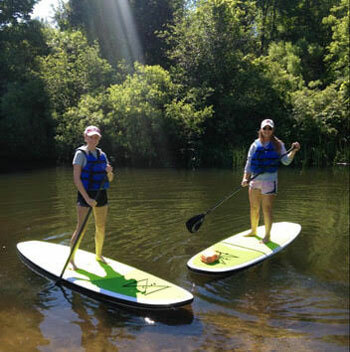 Pentwater Outfitters has SUPs (stand up paddleboards) and kayaks to buy or rent! Owners Gregg and Bonnie have a passion for paddling, educating and "Being On Water." They will be sure to make your visit to Pentwater memorable and exciting. Looking for a fun way to spend your day outside, other than lying on the beach? 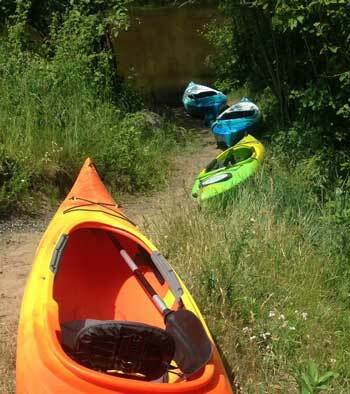 Try an afternoon on Pentwater Lake, Pentwater River, or Lake Michigan--kayaking, canoeing, or paddle boarding! Not only is it fun, it's a great way to be active and enjoy nature. These activities are great for all levels of experience, and something to enjoy for an hour, or all day! 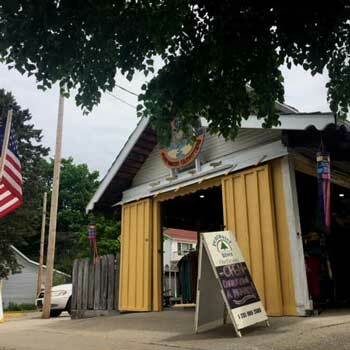 Pentwater Outfitters carries kayaks, canoes, and SUPs (stand up paddleboards) to rent or purchase, and they can even deliver the boat to the location you wish to explore, including the Forks, Estuary, Lake Michigan, and the head of Pentwater Lake...even to your cottage! Prices start at $35 a half day, $55 a day for a single kayak, and $35 a half day, $50 a day for a soft-top SUP. Canoes are $70 a day. Prices include delivery and pick-up within 8 mile radius of the shop. Deliveries outside an 8 mile radius are available at an extra charge. Call the shop for outside area fee. Special deals on weekly rates also available! There are so many benefits to "Being On Water" on a kayak or paddle board. For starters, it's great fun, and you can catch some sun! It's also extremely beneficial to your body...it's a great workout, yet it's a fairly easy activity. Stand up paddleboards offer a great workout because the paddling motion while standing up is driven by your core. It's also a way to get killer arms! Depending on the effort being put into stand up paddleboarding, a person can burn between 225 to 800 calories an hour. That's broken down into 3 common categories of paddleboarding: recreational light, adventure touring, and competition racing. Recreational light takes the smallest amount of effort, and burns the least amount of calories. Competition racing is the most energy intense level, and can burn around 800 calories per hour. Kayaking can have the same benefits, depending on how much effort is being put into the movement. When choosing a paddleboard or kayak to purchase, there are many factors to consider, including the condition of the waters you'll be using it on, your ability level, your size and weight, and your personal paddling goals. When buying a board or kayak locally, Pentwater Outfitters has a knowledgeable staff that can help you choose the best board to fit the variables that effect your needs. Pentwater Outfitters will be operating trips and renting gear for fall color paddles through October - 7 days a week regardless of retail shop hours. Advance reservations recommended. Looking for an early morning or sunset paddle? Just call (231) 869-2999 to arrange!